Soft. Connect Together. Home, Gym, Daycare. Available in 4'x6', 4'x8'. Thickness: 2.5"
Cover made of durable, reinforced vinyl fabric. 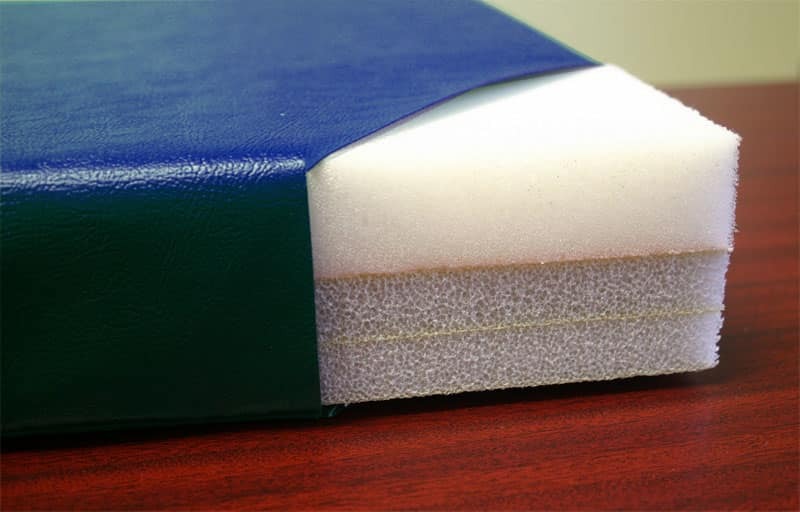 Core made of 1-1/8" soft polyurethane foam over a 1-3/8" thick layer of crosslink polyethylene foam. Hook & Loop (like Velcro) fastener on 2 short or all 4 sides. Now contains no Phthalates and is CPSIA 2008 compliant! *Note: All prices INCLUDE ground shipping within the contiguous USA. *Alternating Colors: 7-10 days delivery. *Solid Colors: 2-3 weeks delivery. The SoftPlay Elementary Tumbling Mats are Ideal mats for toddlers & preschoolers. 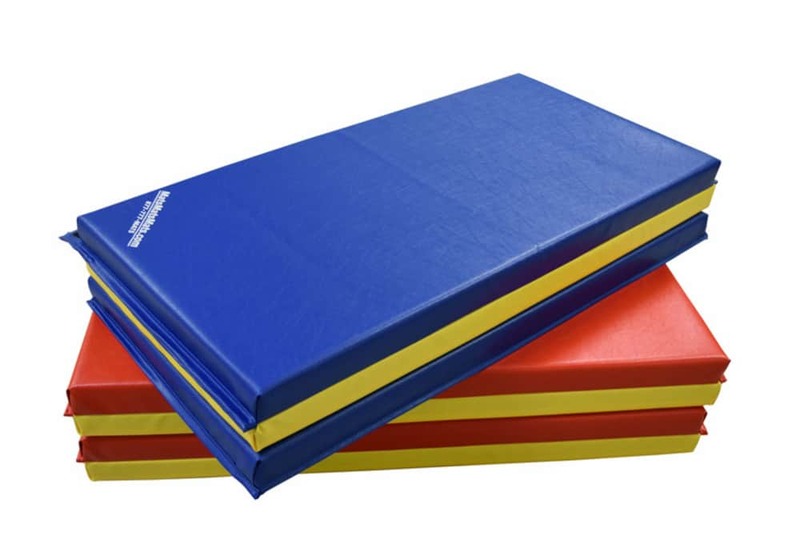 The Elementary Tumbling Mats are soft yet safe and are made with 1-1/8" soft polyurethane foam over a 1-3/8" thick layer of crosslink polyethylene foam. They are designed for general physical education, tumbling, light exercise activities and general fun play for kids. The SoftPlay Elementary Tumbling Mats are excellent for kindergarten, early childhood or daycare centers, and work great as a baby crawling mat as well. They are covered in tough, vinyl fabric to provide puncture and tear resistance and are easy to clean. 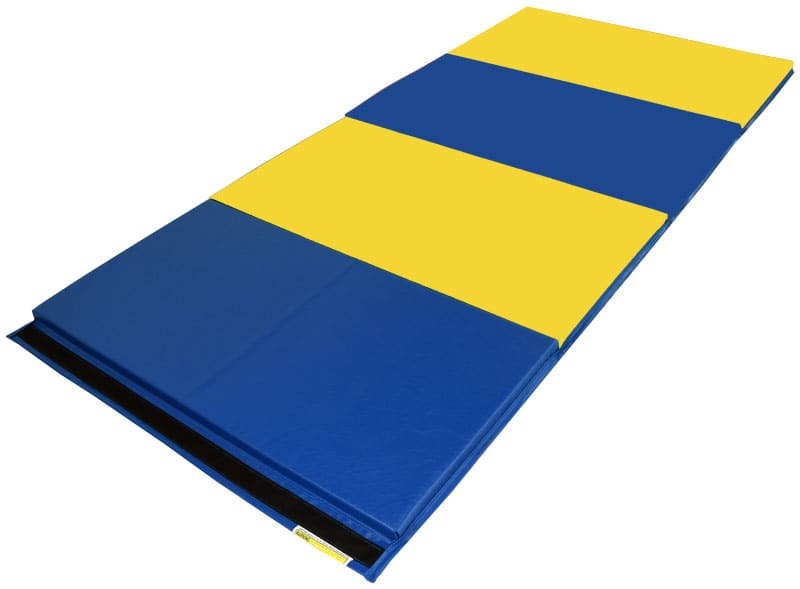 Each mat comes with hook & loop (like Velcro) fasteners on the two short sides or on all four sides to allow extending the mats end-to-end or side-by-side. Folding panels allow easy stacking and storage. Available in 4'x6' or 4'x8'. Cover made of durable, reinforced vinyl fabric. Made of 1-1/8" soft polyurethane foam over a 1-3/8" thick layer of crosslink polyethylene foam. Hook & Loop (like Velcro) fastener on 2 short sides to join mats end-to-end. Hook & Loop (like Velcro) fastener on all 4 sides to join mats end-to-end or side-by-side. Complies with testing standard ASTM F963. These SoftPlay mats are excellent for child play, but their softer top layer density does not lend itself well to gymnastics, martial arts or other activities that require a firmer surface to prevent ankle and wrist injuries. For firmer folding mats, you can choose from our other in-stock or made-to-order folding panel mats. 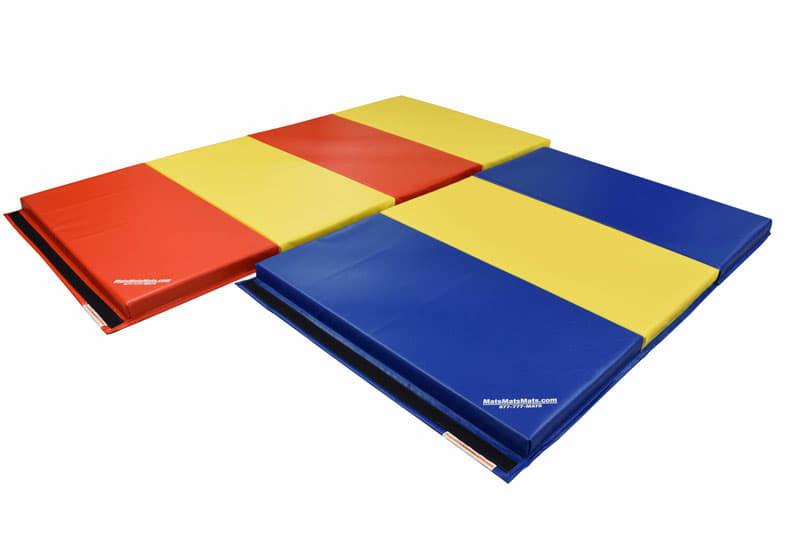 See denser gymnastics tumbling mats that are currently in-stock and ready to ship! See more extensive selection of custom, made-to-order, denser folding mats!